Bean common mosaic virus (BCMV). Mungbean mosaic virus (MBRV), Azuki bean mosaic virus, Bean mosaic virus, Bean western mosaic virus, Blackeye cowpea mosaic virus, Mungbean mosaic virus, Peanut stripe virus, Peanut mild mottle virus, Peanut chlorotic ring mottle virus, Sesame yellow mosaic virus. The BCMV is the most widespread viral disease. It causes some of the most economically important diseases of legume crops around the world. Plant infection may reach 100% in fields and yield losses range from 6 to 98% depending upon the cultivar and time of infection. It is economically important throughout Africa, Europe, North America and Latin America. The type of symptom produced is determined by the strain of BCMV, temperature and the host genotype. The BCMV may incite three types of symptoms: mosaic, systemic necrosis (black root), or local lesions or malformation. Symptoms associated with common mosaic include leaf rolling or blistering, light and dark green patches on the leaf (green mosaic), chlorotic vein banding, yellow mosaic and growth reduction. Mottling and malformation of the primary leaves is an indication that the primary infection occurred through seed. Cultivars which develop common mosaic may have distinct chlorotic or necrotic local lesions which are not associated with the vascular system. Systemically infected plants may have smaller and fewer pods and infected pods may sometimes be covered with small, dark green spots and mature later than uninfected pods. Black root is characterized by local necrotic lesions which extend into the veins causing systemic necrosis in the vascular system; this symptom only occurs in cultivars possessing the dominant resistance gene I. This necrosis can extend into the roots, stem and meristem and may result in plant death if the plant is infected at an early stage. Leaf distortion and blistering, dwarfing, downward curling of leaf margins, vascular necrosis, light and dark green mosaic, ring shaped and pin-point local lesions, distortion of flowers and buds. Natural hosts of BCMV are mainly restricted to Phaseolus spp., especially P. vulgaris . However, BCMV has been isolated naturally from other leguminous species including Phaseolus acutifolius, Phaseolus lunatus, Arachis hypogaea, Bauhinia purpurea, Cajanus cajan, Centrosema pubescens, Chenopodium quinoa, Cicer arietinum, Clitoria ternatea, Crotalaria incana, Crotalaria juncea, Crotalaria spectabilis, Cucumis sativus, Cyamopsis tetragonoloba, Glycine max, Lablab purpureus, Lupinus angustifolius, Lupinus luteus, Lupinus albus, Macroptilium atropurpureum, Macroptilium lathyroides, Medicago sativa, Melilotus alba, Pisum sativum, Rhynchosia minima, Senna sophera, Sena tora, Sesbania herbacea, Trifolium incarnatum, Trifolium pretense, Trifolium repens, Trifolium subterraneum, Trifolium hybridum, Vicia sativa, Vicia villosa, Vigna radiata, Vigna unguiculata, Vigna vexillata and Vigna subterranean. The virus is probably distributed worldwide (in Phaseolus beans wherever they are grown). Virus is of the genus Potyvirus in the family Potyviridae. Filamentous particles are about 750 nm long and 15 nm wide. Virus is transmitted by mechanical inoculation (sap), transmitted by seeds (up to 83% in Phaseolus vulgaris and from 7 to 22% in tepary bean, transmitted by pollen to seed. The virus is transmitted by arthropods, by insects of the order Hemiptera, family Aphididae; Acyrthosiphon pisum, Aphis craccivora, A. fabae, Myzus persicae and other species. The virus is transmitted in a non-persistent manner. Bean common mosaic is caused by two species of the genus Potyvirus: Bean common mosaic virus (BCMV) and Bean common mosaic necrosis virus (BCMNV). ELISA, kit for Potyvirus group. Possible control measures for BCMV include planting healthy seed, improving cultural practices, controlling the vector and host plant resistance. ICTVdB Management (2006). 00.057.0.01.007. Bean common mosaic virus. In: ICTVdB – The Universal Virus Database, version 4. Büchen-Osmond, C. (Ed), Columbia University, New York, USA. Alan B, Crabtree K, Dallwitz M, Gibbs A, Watson L, editors. 1996. Viruses of Plants. Description and Lists from the VIDE Database. CAB International, UK. 1484 pp. Frison EA, Bos L, Hamilton RI, Mathur SB, Taylor JD, editors. 1990. FAO/IBPGR Technical Guidelines for the Safe Movement of Legume Germplasm. Food and Agriculture Organization of the United Nations, Rome/International Board for Plant Genetic Resources. Gad L, Thottappilly G, editors. 2003. Virus and Virus-like Diseases of Major Crops in Developing Countries. Kluwer Academic Publishers, Dordrecht. 800 pp. Gálvez GE, Morales FJ. 1989. Aphid-transmitted viruses. In: Schwartz HF, Pastor-Corrales MA, editors. Bean production problems in the tropics. Centro Internacional de Agricultura Tropical (CIAT). Cali, Colombia. pp. 333-362. Morales FJ. 2003. Common Bean, In: Loebenstein G, Thottappily G, editors. Virus and Virus-Like Diseases of Major Crops in Developing Countries. Kluver Academic Publisher, London, UK. pp. 425-445. Morales FJ. 1979. Purification and serology of bean common mosaic virus. Turrialba 29(4):320-324. Morales FJ, Bos L. 1988. Bean common mosaic virus. AAB Descriptions of Plant Viruses No. 337. Association of Applied Biologists, Wellesbourne. Morales FJ, Castaño M. 2008. Enfermedades Virales del Frijol en America Latina. International Center for Tropical Agriculture, Virolgy Unit. Morales FJ, Castaño M. 1986. Seed transmission characteristics of selected bean common mosaic virus strains in differential bean cultivars. Plant Dis. 71:51-53. Olufemi Williams A, Mbiele AL, Nkouka N, editors. 1988. Virus Diseases of Plants in Africa. Organization of African Unity/Scientific, Technical & Research Commission (OAU/STRC), Technical Center for Agricultural & Rural Cooperation: Lagos Nigeria. 225 p.
Groundnut mottle virus, Peanut mild mosaic virus, Peanut severe mosaic virus. Is considered to be economically important on a global scale. Yellow vein clearing, crinkled leaves, blistered leaves, ring foliar lesions, variegation, deformed leaves, mottling with necrosis and mosaic chlorotic ringspot in leaves, mild leaf chlorosis and stunting. PeMoV is principally a disease of the peanut but occasionally it can affect fields of common bean in the surrounding areas of peanut production. Other host: Amaranthus retroflexus, Arachis hypogaea, Arachis pintoi, Beta vulgaris, Brassica rapa, Cajanus cajan, Chenopodium murale, Chenopodium quinoa, Chenopodium album, Citrullus lanatus, Crotalaria spectabilis, Cucumis sativus, Cyamopsis tetragonoloba, Glycine max, Lupinus angustifolius, Lupinus albus, Macroptilium lathyroides, Medicago sativa, Melilotus alba, Melilotus officinalis, Phaseolus acutifolius, Phaseolus lunatus, Pisum sativum, Senna bicapsularis, Senna obtusifolia, Senna occidentalis, Senna tora, Trifolium incarnatum, Trifolium pretense, Trifolium repens, Trifolium subterraneum, Trifolium hybridum, Vicia villosa, Vigna unguiculata and Vigna subterranean. This virus affects bean in Africa, Australia, United States and Latin America. The virus is of the Potyvirus genus in the Potyviridae family. The capsid is filamentous, flexuous with a clear modal length with a length of 740-750 nm. The virus is transmitted by mechanical inoculation; transmitted by seeds 0.02-2% in Arachis hypogaea; to 1% in Phaseolus vulgaris and to 0.008% in Vigna unguiculata (Demski et al., 1983), but not in Glycine max, Pisum sativum and Cassia obtusifolia. the virus is transmitted by arthropods, by insects of the order Hemiptera, family Aphididae; Aphis craccivora, A. gossypii, Hyperomyzus lactucae, Myzus persicae and Rhopalosiphum padi. The virus is transmitted in a non-persistent manner (A. craccivora can remain infective for 2 hours and M. persicae for 12 hours after acquisition (Paguio and Kuhn, 1974). Seed transmission in peanuts and beans, mottle and necrosis in peanut, bean and pea, Arachis glabrata resistant. Prevent its spread to commercial seeds by destroying infected experimental peanut plantings. Roguing is another method of control but would not necessarily be reliable since symptoms are not always evident on recently infected plants. Aphid populations may be controlled by various registered insecticides. Rejection of accession and new regeneration seed process in field. ICTVdB Management (2006). 00.057.0.01.049. Peanut mottle virus. In: ICTVdB – The Universal Virus Database, version 4. Büchen-Osmond, C. (Ed), Columbia University, New York, USA. Bijaisoradat M, Kuhn CWY, Benner CP. 1988. Disease reactions, resistance and viral antigen content in six legume species infected with eight isolates of peanut mottle virus. Plant Disease 72:1042-1046. Kuhn CWY, Morales FJ. 2005. Peanut mottle. pp 79-80, in: Compendium of Bean Disease. Schwartz HF, Steadman JR, Hall R, Forster YRL. American Phytopathological Society, Segunda Edición, St. Pail, MN. Marco S. 1986. Identification of Peanut mottle virus in Israel. Springer Netherlands. Volume 14, Number 3. Olufemi WA, Mbiele AL, Nkouka N, editors. 1988. Virus Diseases of Plants in Africa. Organization of African Unity/Scientific. Technical & Research Commission (OAU/STRC), Technical Center for Agricultural & Rural Cooperation: Lagos Nigeria. 225 pp. Thomas JE, Redden RJ, Usher T. 1990. 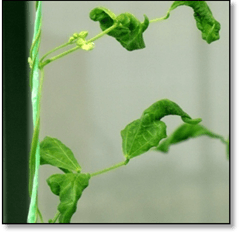 Screening for resistance to peanut mottle virus in accessions and breeding lines of Phaseolus vulgaris. pp. 163-164, in: Bean Improvement Cooperative 1990 Annual Report. 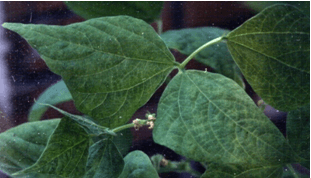 BSMV is undoubtedly the most widely distributed of the beetle-borne viruses which infects beans. It is considered to be economically important on a global sacale. The virus can reduce bean yields as much as 83 to 94 % reducing the amount and weight of seed produced by infected plants. In Phaseolus it can induce diverse symptoms such as mosaic, or mottle, rugosity, epinasty, vein yellowing, stunting, and necrotic local lesion, depending on the variety inoculated. The virus has a host range restricted to legumes. Casia tora, Cicer arietinum, Cyamopsis tetragonoloba, Glycine max, Lupinus albus, Melilotus albus, Phaseolus acutifolius, P. lunatus, P. vulgaris, Pisum sativum, Vigna mungo, V. radiata, V. subterranea, V. unguiculata and Vigna unguiculata ssp. Sesquipedalis. The virus was first observed in southern United States and now is present in all the main bean producing nations of the world. The virus spreads in Africa, North America, South and Central Americas, France and Spain. SBMV is a type member of the sobemovirus group which characteristically has isometric particles 28 to 30 nm in diameter and contains one molecule of positive-sense single-stranded RNA. The virus is transmitted by a vector. The virus is transmitted by sap, mechanical inoculation, grafting, seeds 3-7% in V. unguiculata cv. ; it is transmitted by pollen to seed and transmitted by pollen to the pollinated plant. The virus is seed-borne and can be carried both in the embryo and as a contaminant on the seed coat. This virus, however, becomes inactivated upon the dehydration or storage of contaminated seeds. Secondary transmission occurs naturally by several species of chrysomelid beetles such as Cerotoma facialis, C. trifurcate and Epilachna varivestis. The virus is transmitted in a semi-persistent manner. Virus free seed, grown in areas where the virus does not occur, should be used. Insecticides that reduce beetle population should be helpful. BSMV is best controlled by planting resistant cultivars. ICTVdB Management (2006). 00.067.0.01.001. Southern bean mosaic virus. In: ICTVdB – The Universal Virus Database, version 4. Büchen-Osmond, C. (Ed), Columbia University, New York, USA. Gergerich RC, Morales FJ. 2005. Bean southern mosaic. Pp 71-72. In: Schwartz HF, Steadman JR, Hall R, Forster YRL, editors.Compendium of Bean Disease. American Phytopathological Society, Second edition, St. Paul, MN. Jayasinghe U. 1982. Chlorotic mottle of bean. PhD Thesis, Agric. Univ. Wageningen, the Netherlands. 156 pp. McDonald JG, Hamilton RI. 1972. Distribution of Southern bean mosaic virus in the seed of Phaseolus vulgaris. Phytopathology 62:387-389. Morales FJ, Castaño M. 1985. Effect of a Colombian isolate of bean southern mosaic virus on selected yield components of Phaseolus vulgaris. Plant Diseases 69:803-804. Morales FJ, Castaño M. 2008. Enfermedades Virales del Frijol en America Latina. Interantional Center for Tropical Agriculture, Virolgy Unit. National Bureau of Plant Genetic Resources. 1994. Checklist on Seed Transmitted Viruses: Leguminous Hosts. National Bureau of Plant Genetic Resources (NBPGR), India. 14 pp. Shepherd RJ, Fulton RW. 1962. 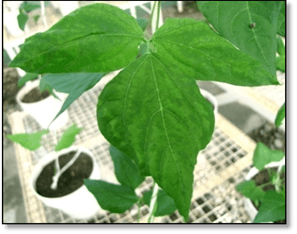 Identity of a seed-borne virus of cowpea. Phytopathology 52:489-493. Tremaine JH, Hamilton RI. 1983. Southern bean mosaic virus. CMI/AABDescriptions of Plant Viruses No. 274. Commonwealth Agricultural Bureaux, Slough.